Photograph Contributed by Kay Rome. 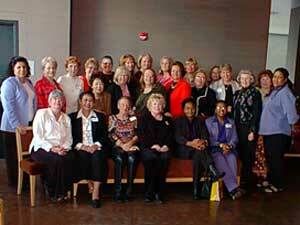 February 26th, 2005 marked the 3rd Annual Aramco Women’s Group USA Luncheon in Southern Nevada hosted by Kay Rome and Marilyn Hayward. The luncheon was held at the Mariposa Room of Neiman Marcus in Las Vegas with a bird's eye view of the new Wynn Casino across the street. A raffle was held using Saudi memorabilia brought by attendees to the luncheon. Proceeds from the raffle went to support the troops in Iraq. There were also tons of door prizes.